What’s new? This is a process that is lean, fast, and effective in getting teams focused and back on track when material changes are made in a project. Setting “boundary conditions” at the time of a project’s approval is an effective way to create a “contract” between the management and project teams. This contract allows teams to move forward with minimal guidance as long as the boundary conditions (typical cost, schedule, features & quality) are not crossed. And when those boundaries are crossed, the Out of Bounds (OOB) review is the mechanism to course correct and realign to a new plan of record. Even with the best efforts to anticipate and mitigate project risks, sometimes projects go off the rails. And when that happens, more times than not, its difficult to get the team refocused and back on track. There is often ambiguity around who makes the decisions that resets the course of the team, and result is lost time, inefficiency, confusion and frustration. 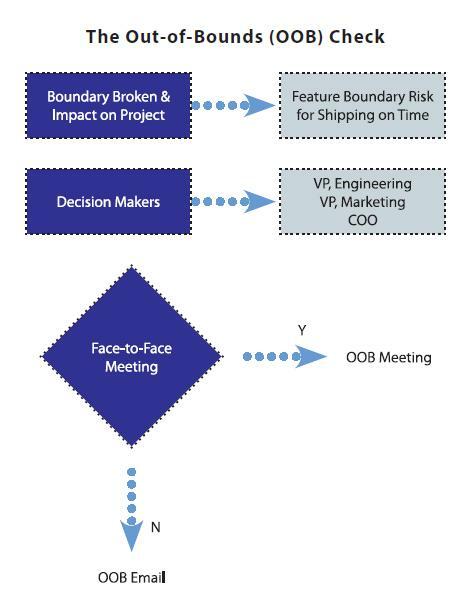 The Out of Bounds Review is a simple tool that provides a team the mechanism to quickly conduct a root cause analysis, evaluate alternatives, and then recommend a remedy to the project decision makers.. It should be the intent of both the project team and the key decision makers to complete this process quickly – hours/days, not days/weeks. Projects are re-aligned within hours/days, not days/weeks. Once boundary conditions are established the team is empowered to move forward with minimal guidance. There is a single, agreed upon communications vehicle, and source of information – this consistency minimizes confusion and churn on the team. This light-weight process is an effective recovery vehicle for when projects go off the rails. It creates a common language and mechanism to quickly align the project and management teams when a project has changed significantly. There is not time wasted by each team trying to create an exception handling process each time a deviation occurs. The result is faster analysis, decision-making and alignment on a new plan of record. It is critical that there is agreement throughout the organization that the process will be consistently used, and the each project constituency executes there role on a timely basis. The value of this process lies in managing within relevant boundaries of the project and then accelerating decision making when the project breaks the boundary conditions. If there is a break down in roles and responsibilities, the process will be marginalized and possible exacerbate the impact of the broken boundary.